Suggested by Iain in the comments yesterday, I love this technique for its simplicity and awesomeness. Leave the replace field empty. It is that simple. Do not believe me? See this demo. Thanks Iain for teaching us this trick. Chose “Delimited” in step 1 and click next. You will get all folders in to separate cells and file name in last cell. For both methods below, you first need to insert a new module and add the code in that. As suggested by Daniel Ferry in the comments. Note: this UDF returns an array for file name & extension. So you need to enter it in 2 cells together. The InStrRev() built in function searches for \ in the sPath from end and returns the first occurrence’s position. 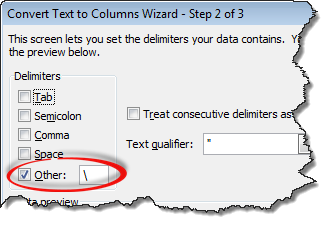 For most of my data cleaning needs, I use a mix of text to columns, find-replace or VBA. In rare cases, I rely on a formula. This is because data cleaning or extraction is usually one time step and figuring out a complex formula is not good idea in such cases. What about you? How do you go about extracting filenames, dates, numbers etc. buried in text? What method do you use often? Please share with us in comments. If you double click on that file, you will create a file in C:\temp called filelist.txt that will have all of the files in that directory. 3) In the excel workbook, import data from text, to make a data table from the filelist.txt file in the C:\temp directory. Select the properties, deselect where it says to prompt for the file name, and have it update on the file opening and whatever time interval you specified. That works especially well on network drives where multiple users might be adding files. sorry, change that *.jpg to *. * to list all files, or change the extension as desired. You can also add a -s between the second double quote and the greater than symbol to look in all of the subdirectories (be careful there - if you look in C:\ or C:\windows and search all subdirectories, you will get a huge file). I just wanted to note that there was a typo in the UDF for ExtractFileName. In one place, the variable is defined as filespath, but in the calculation formula, the variable appears as filepath. Yes, that's true. Sorry for that. In a slight modification of the Text To Columns option, in step 3 of 3 of the Text To Columns procedure, the last radio button under Column Data Format allows you to specify those columns you do NOT wish to import. Thus in the display at the bottom of the dialogue box, you can Shift-Select all the columns before the file name, click Do Not Import Column (Skip) then Finish. Only the file name is imported! In my haste I did not appreciate the fact that there are several records that will result in different numbers of columns. In which case the option I mentioned above would workbench appropriate. Vba as suggested by PPH is not correct. 3. Type "=", press left arrow, then Ctrl+Enter. The last column will have file names. I'd like to know how you created that animation of selection, find/replace. Looks cool in emails.